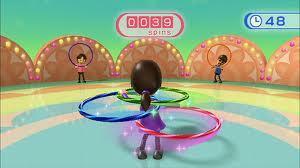 The Wii Fit is a game for the Wii that helps you workout in a fun and creative way! For starters you take a Wii Fit Body test by doing this you get to see your weight, COB (center of Balance), and your BMI (Body Mass Index). After this you can play games that help with balance, flexibility and building muscles. You can hula hoop to build muscles, do some yoga for flexibility, you can go on runs, or do some down hill skiing! Or you can do some nice and relaxing aerobic steps. This game also can help set a weight goal, if you wan to gain or lose pounds! But you can also play if you don’t have a goal in mind, like me. I play for the fun of it! Inorder to play you also need a Wii Fit Board, but that comes with the game if you buy it at a store.